His friends never did approve, wondering what he saw in the life of a suburb dwelling, bridge playing, Saturday-mornings-playing-golf-Sunday-evenings-at-church existence. His choices seemed bland…boring…a stripped down version of his former fun loving, bar hopping self. But they didn’t see the way he looked at her in the morning when the slumber still lay heavy on her head. Small lines etched in the corners of her eyes, dimple gracing her left cheek – a lifetime of experiences wrapped up in a firecracker of a woman whose heart took his breath away. He watched her ease slowly into the day, slight smile twitching at the corner of her mouth, and knew this boring existence would be the greatest adventure in his life. 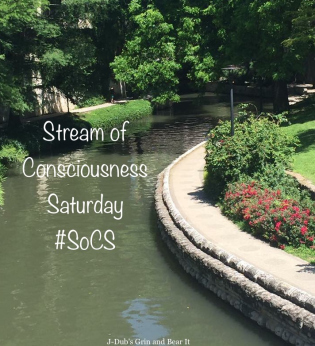 We join Linda’s stream of consciousness post on Saturdays. This week’s prompt is “his/her(s)” with instructions to use one or both. I’m rocking the bonus points today for starting with one and ending with the other. Whoop whoop!